SYRACUSE, N.Y. With his wife, Juli, looking on at the postgame press conference and his young children close by, Syracuse coach Jim Boeheim's final remarks were not about his milestone 900th career victory. "If we cannot get the people who represent us to do something about firearms, we are a sad, sad society," Boeheim said Monday night. "If one person in this world, the NRA president, anybody, can tell me why we need assault weapons with 30 shots -- this is our fault if we don't go out there and do something about this. If we can't get this thing done, I don't know what kind of country we have." Mayor Bloomberg on U.S. gun laws: "What kind of craziness is this?" It was a sobering end to what was a memorable evening for Syracuse basketball. The third-ranked Orange's 72-68 victory over Detroit in the Gotham Classic made Boeheim just the third Division I men's coach to reach 900 wins. Boeheim, 68 and in his 37th year at his alma mater, is 900-304, and joined an elite fraternity. Mike Krzyzewski (936) and Bob Knight (902) are the only other men's Division I coaches to win that many games. "To me, it's just a number," said Boeheim, whose first victory was against Harvard in 1976. "If I get 900, have I got to get more? That's why maybe it's just not that important to me, because to me it's just a number, and the only number that matters is how this team does." So far, it's done OK.
James Southerland had 22 points for Syracuse (10-0), which increased its home winning streak to 30 games, longest in the nation. Detroit (6-5), which lost 77-74 at St. John's in the second game of the season and 74-61 at Pitt earlier this month, had its four-game winning streak snapped. Dave Bing, Boeheim's college roommate, teammate and fellow Hall of Famer, and Roosevelt Bouie, a star on Boeheim's first team in 1976-77, were in the Carrier Dome crowd of 17,902. Bing was standing tall in the locker room after the game. "Nobody would have thought when we came here 50 years ago that either one of us would have had the kind of success we've had," said Bing, today the mayor of Detroit. "I'm so pleased and proud of him because he stuck with it. He's proven that he's one of the best coaches ever in college basketball, and he'll be No. 2 shortly." After a victory that nearly was short-circuited, Boeheim was presented a jersey encased in glass with 900 emblazoned on it. "I'm happy. I've stayed around long enough. I was a little nervous," Boeheim said at center court. "I'm proud to be here. To win this game is more pressure than I've felt in a long time. I wasn't thinking about losing until the end. That wouldn't have been a good thing to happen, but it very well could have." Midway through the second half, with Syracuse dominating, fans were given placards featuring cardboard cutouts of Boeheim's face with 900 wins printed on the back to wave in celebration. But when the public address announcer in the Carrier Dome invited fans to stick around for the postgame ceremony, the Titans roared back. Juwan Howard Jr., who finished with 18 points, scored 14 over the last 6 minutes to key a 16-0 run, his two free throws pulling Detroit within 67-63 with 55.1 seconds left after the Titans had trailed by 20 with 6:09 to play. "You know what, I didn't hear it, but the players probably heard because they sure came alive," Detroit coach Ray McCallum said. "This is a big stage. Guys sitting around the hotel watching television getting ready to play the No. 3 team in the country and they're talking about going for 900 wins, coach Boeheim. That's a lot for a young man to digest." Michael Carter-Williams hit three of four free throws in the final seconds to secure the win. "Michael made big-time free throws you've got to make. If he misses a couple, it's a new game. That was the difference," Boeheim said. "We have not been in that situation. Hopefully, we'll learn from that." Carter-Williams finished with 10 assists and 12 points, his sixth straight double-double. "It was great to be part of this," Carter-Williams said. "It's a part of history." Doug Anderson scored 18 points and Nick Minnerath had 13 for Detroit. Ray McCallum Jr., the coach's son and Detroit's leading scorer at 19.4 points per game, finished with nine, while Jason Calliste had seven. Southerland scored a career-high 35 points, matching a school record with nine 3-pointers, in a win at Arkansas in late November and, after an 0-for-10 slump over three games, found his range again Saturday night with three 3s in a win over Canisius. He finished 5 of 8 from behind the arc against the Titans. One of the keys to breaking Syracuse's 2-3 zone is hitting the long ball, and Detroit struck out in the first half. The Titans were 0 for 10 and the lone 3 they did make  by McCallum with just over 6 minutes left  was negated by a shot-clock violation. Detroit could only lament what might have been if a couple had gone in. "We never gave up. That's a tribute to our team," Howard said. "We had the right attitude. We played a tough opponent. You usually don't want a moral victory, but we can take some positives from this game." Syracuse plays again Saturday against Temple in Madison Square Garden, and the Orange faithful are likely to be out in numbers as they usually are when the team plays there. 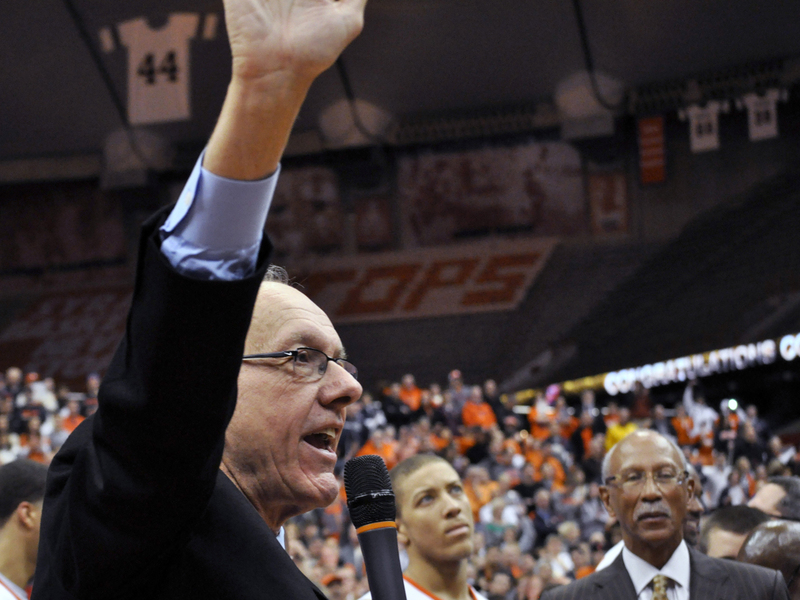 Boeheim was effusive in praise of the support the team has received during his long tenure. Syracuse has had 71 crowds of over 30,000 since the Carrier Dome opened in 1980 and holds the NCAA on-campus record of 34,616, set nearly three years ago against Villanova. "The support of fans cannot be overestimated," he said. "You have to have that kind of support in your building to bring recruits in, to help you play better. We've had a tremendous loyal fan base. That's why I always felt this was a great place to coach and why I never really thought about going anywhere else. The support from the fans is the No. 1 thing you have to have."